Minister of the Federal Capital Territory, Malam Muhammad Musa Bello has disclosed that the FCT Administration will use the opportunity of the 19th National Sports Festival to put Abuja on the global map of sports tourism in order to attract investment and economic development. The FCT Minister who made this disclosure on Tuesday, December 4, 2018, during the press briefing on the 19th National Sports Festival scheduled to hold in Abuja from 6th to 16th December, 2018, said the FCT Administration is committed to developing a sporting brand like other major cities of the world, adding that the current investment in infrastructure, rail transportation and public utilities are geared towards making the city attractive for these purposes. The Minister, while also describing sports as one of the three major pillars of national unity, including the National Youth Service Corps and the FCT, said that the FCTA in promoting the ideals that unite the country together, rose to the occasion to revive the National Sports Festival that had been in limbo for the past 6 years. 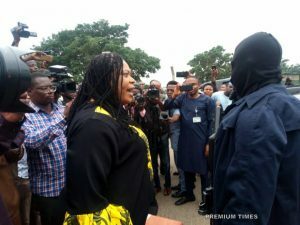 Malam Bello said the FCT as co host has been assigned a portfolio of four critical subcommittees, namely – Opening and Closing Ceremonies sub-committees as well as security and transportation, out of the 17 subcommittees that constitute the Main Organizing Committee (MOC). He said the FCT will also support the Games Village subcommittee with some vital logistics. The Minister further disclosed that the FCT Permanent Secretary, Sir Chinyeaka Ohaa, who is a veteran insports administration, having once served as Permanent Secretary, Sports Ministry, will chair the Local Organizing Committee (LOC), and will also function as Vice Chairman of the Main Organizing Committee (MOC). Bello added that the FCT, beyond its role as anchor to the LOC, would be rolling out 470 athletes and officials who would be competing in over 27 events, adding that both closed and open camps have been held for the athletes. He said the FCT’s contingent to the event cut across the entire ethnic and geographical landscape of the country, reflecting the rich diversity and vision of FCT as the centre of national unity. “Our objective is also not only to host but to showcase Nigeria at its best and come tops in the competitions,” the Minister stated. 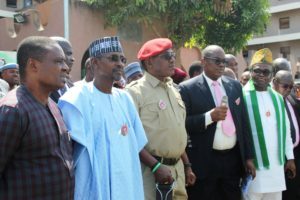 In his own remarks at the occasion, the Minister of Youth and Sports Development, Barrister Solomon Dalung, said the Federal Government in realizing the damage that the unending postponements of the festival portends for sports development in Nigeria, accepted the resolution of the National Council on Sports to take over the organization and hosting of the Games in 2018 with Abuja as the host city. He commended the FCT Administration and other stakeholders for working to pull off such huge achievement of hosting the event which would normally require two years in advance for preparations. Dalung who noted that the National Sports Festival had been organized without visible corporate sponsors since inception in 1973, disclosed that a partnership agreement has been signed with Messrs Greenfield Asset Ltd to rebrand, repackage, market and deliver 5 editions of the event for the next 10 years.